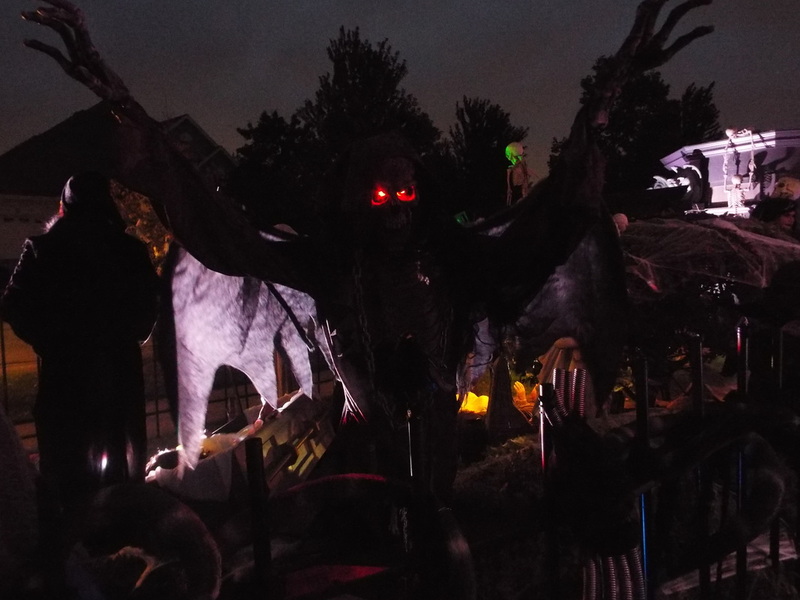 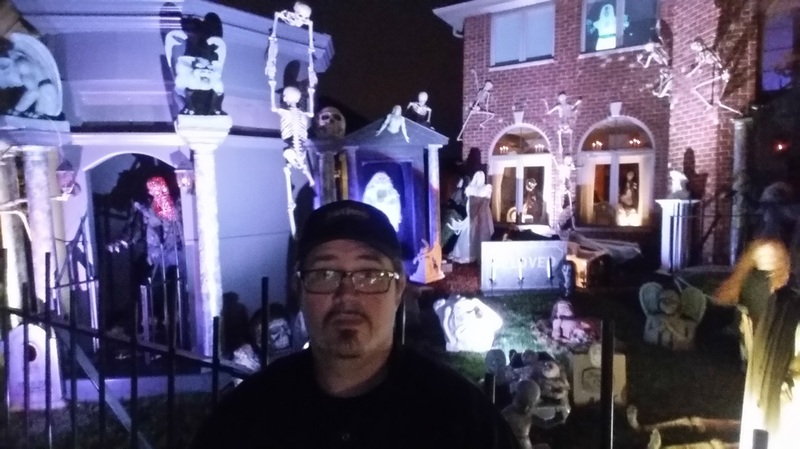 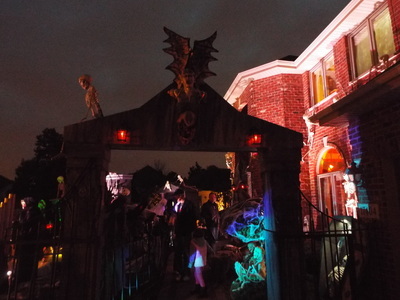 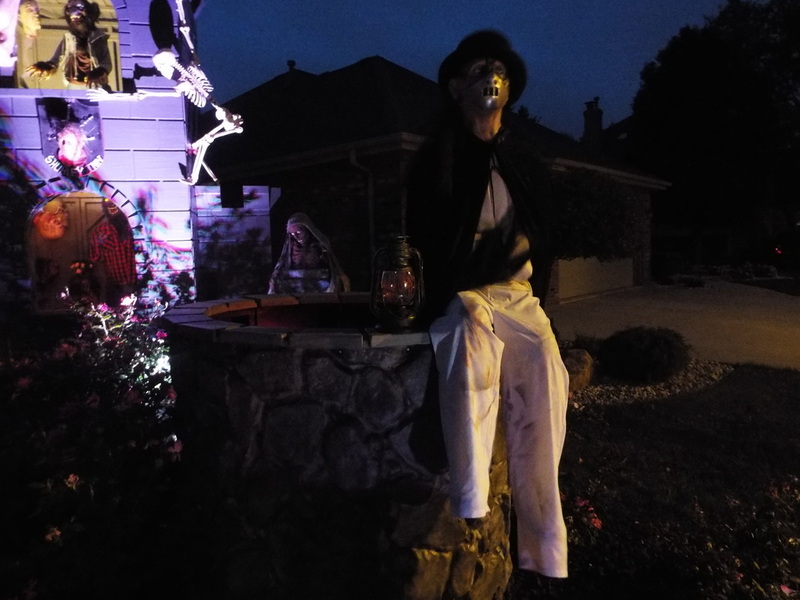 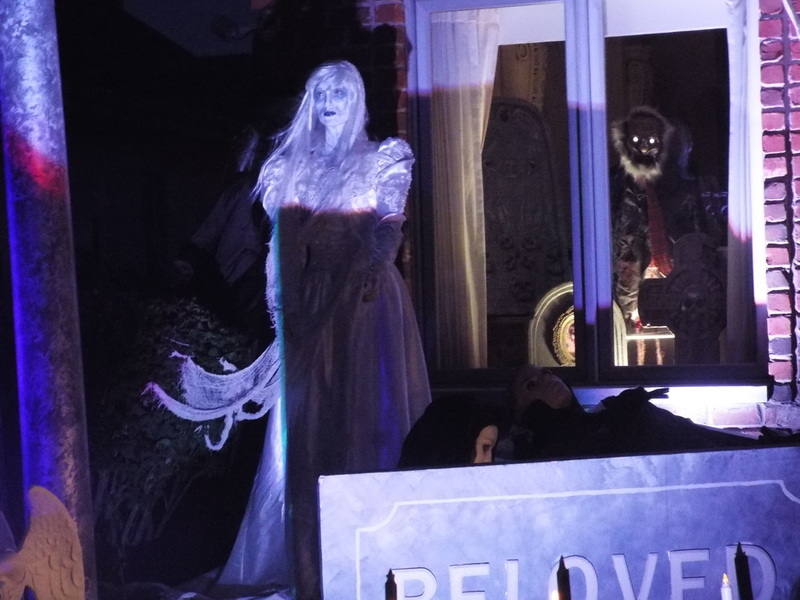 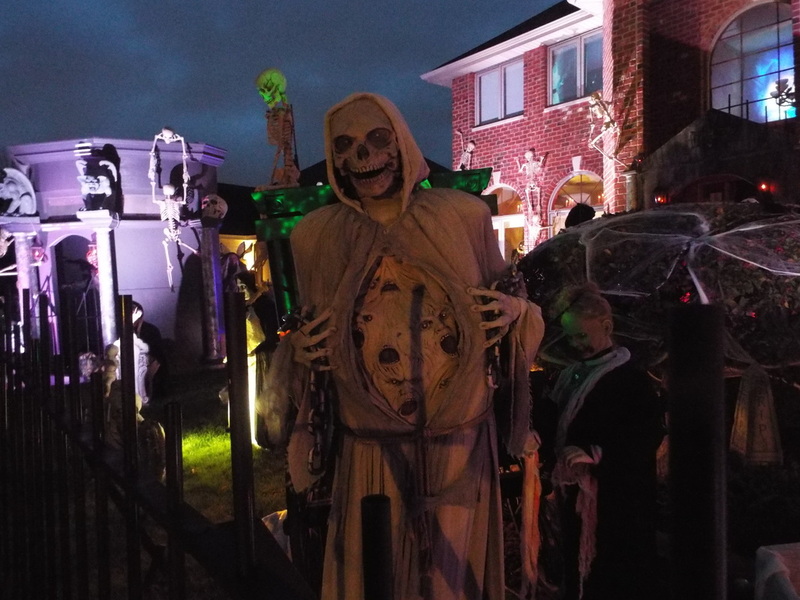 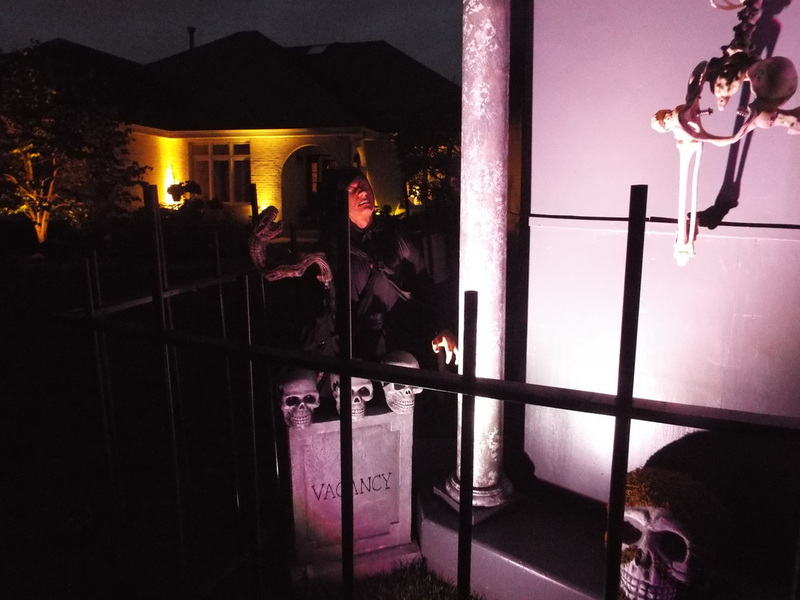 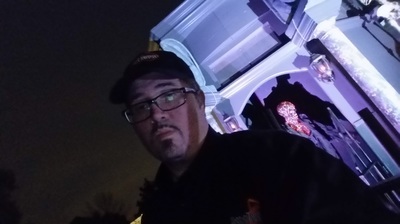 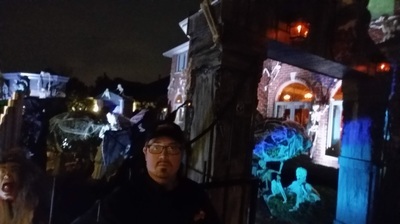 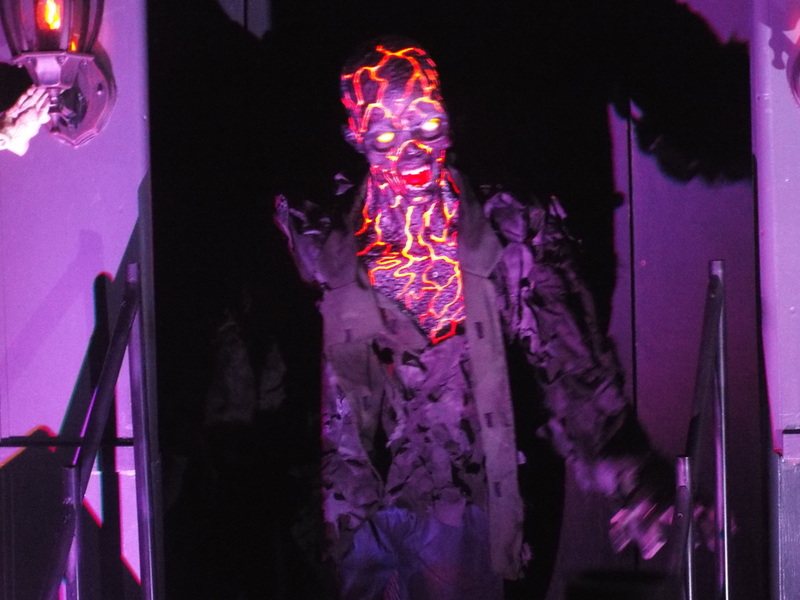 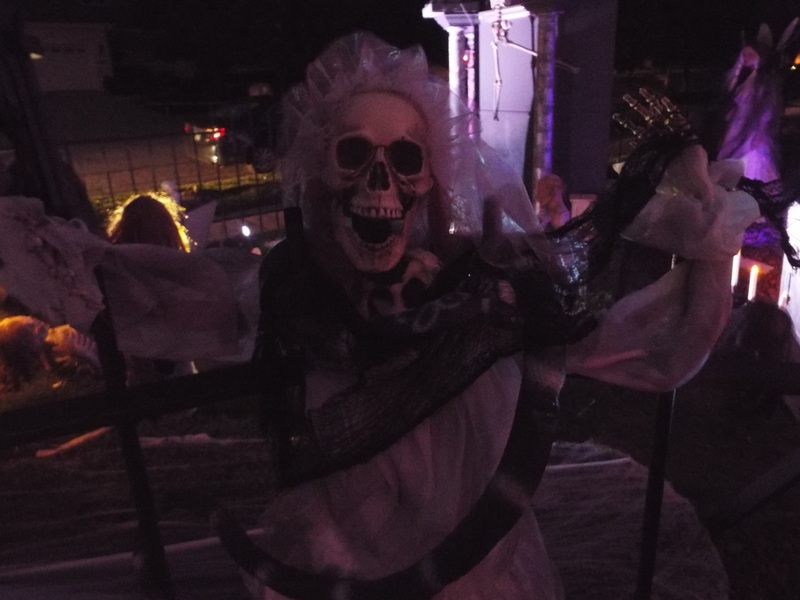 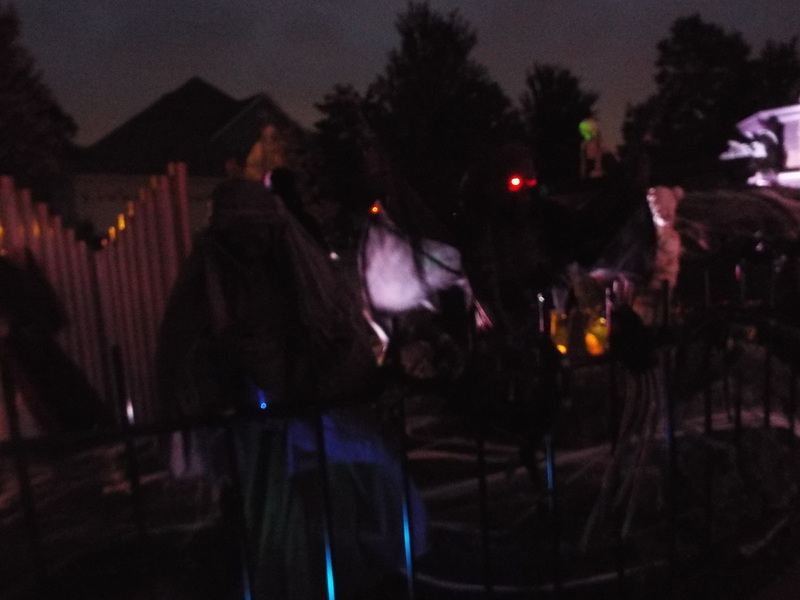 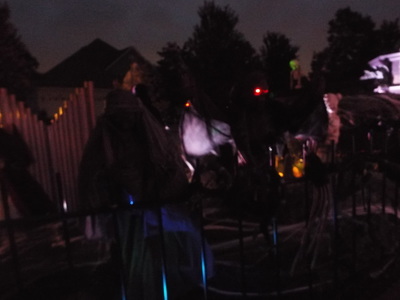 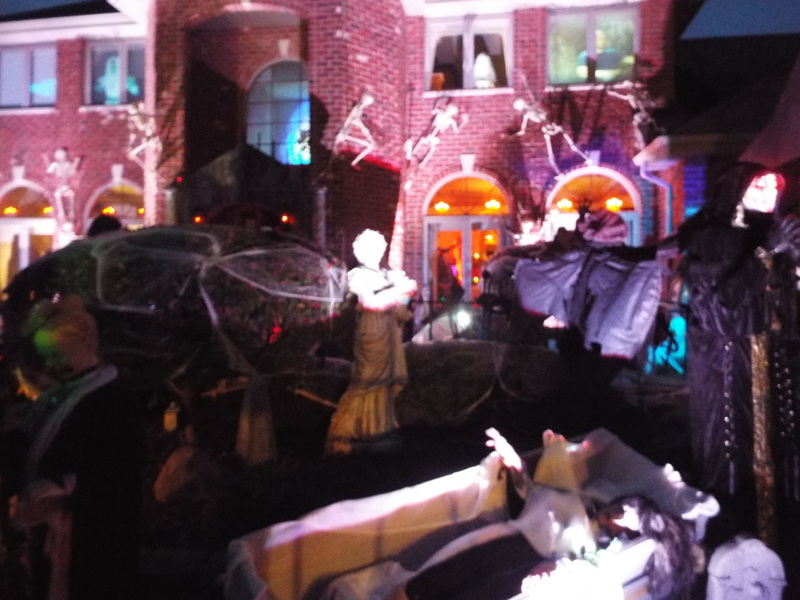 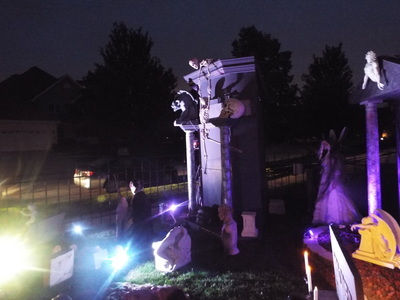 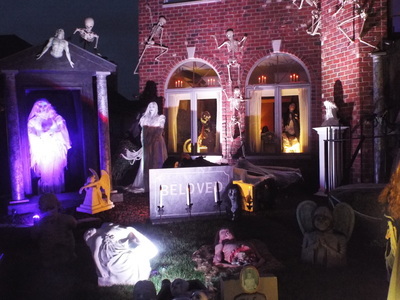 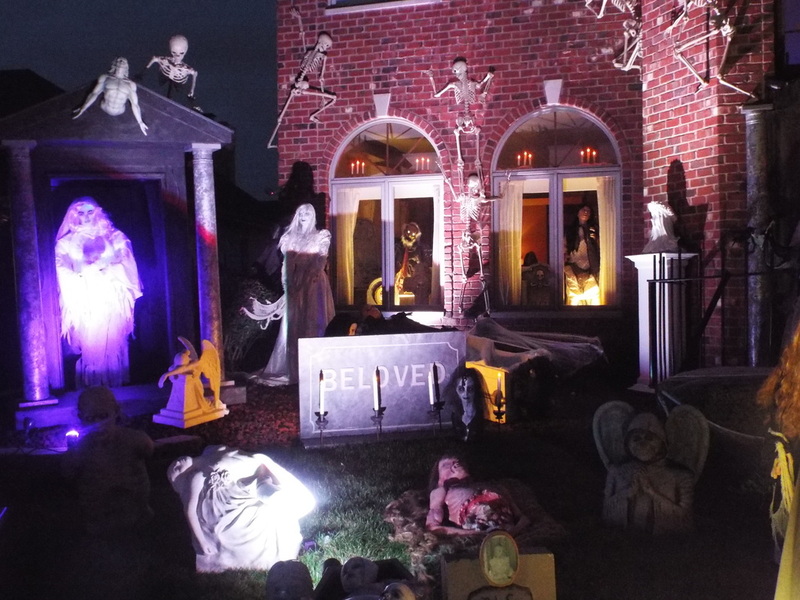 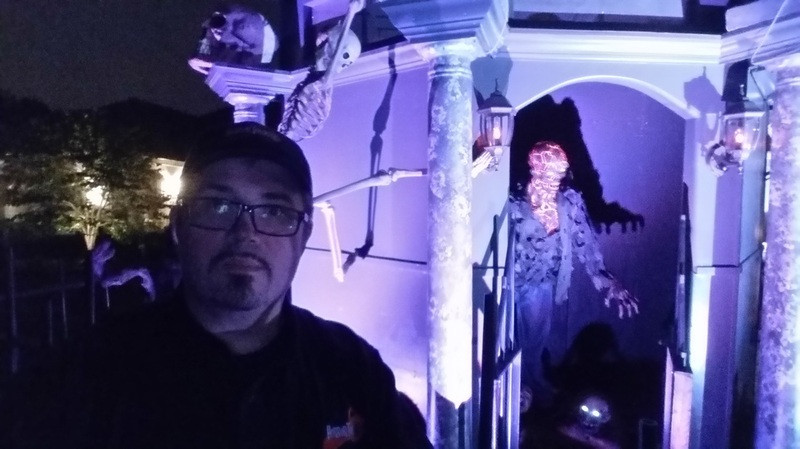 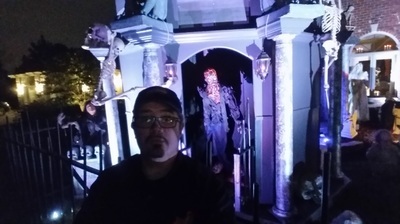 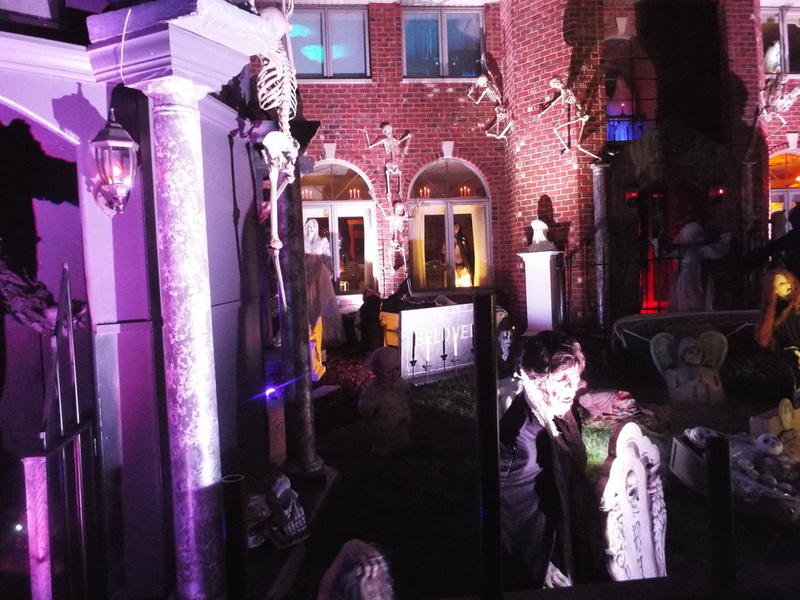 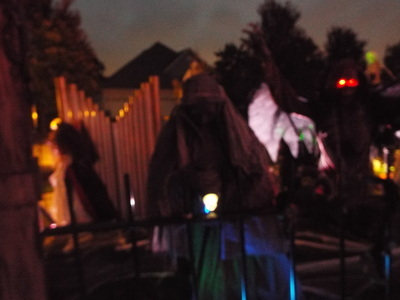 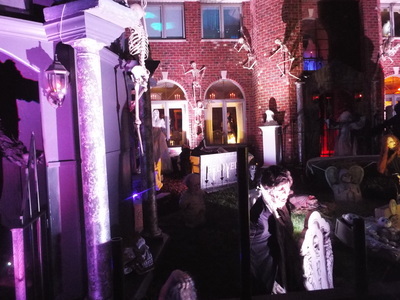 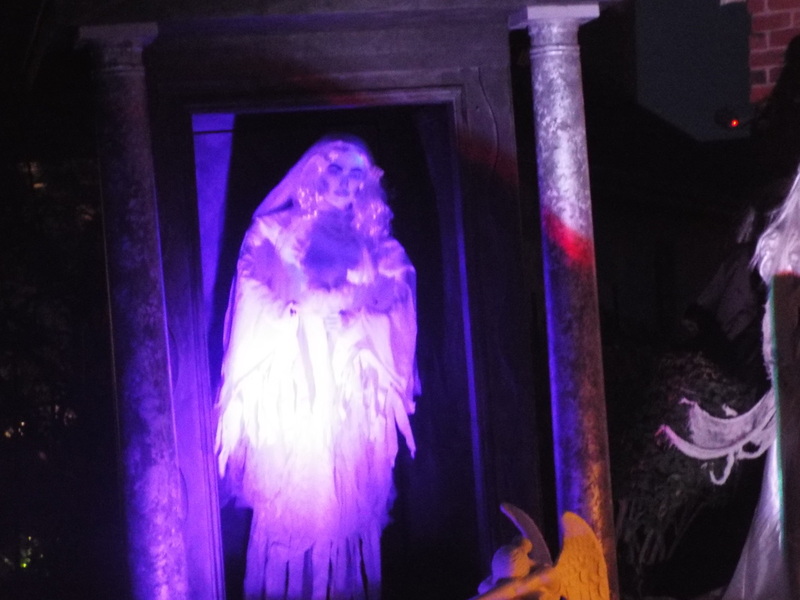 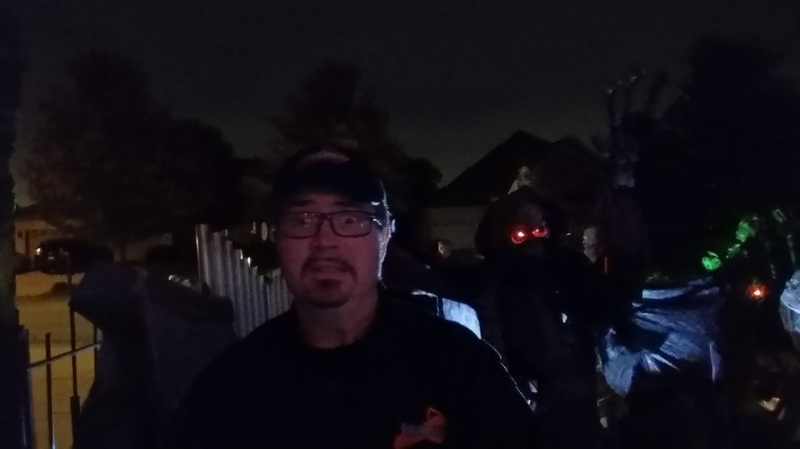 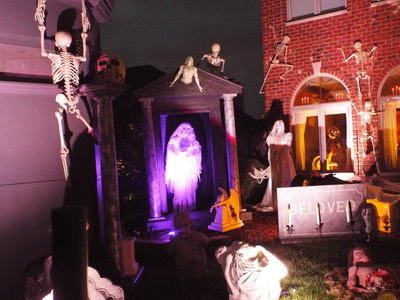 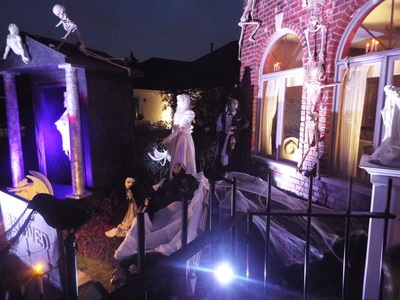 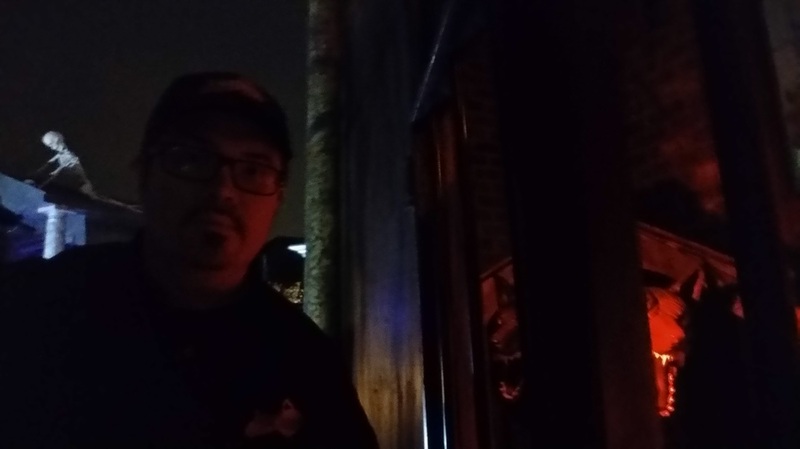 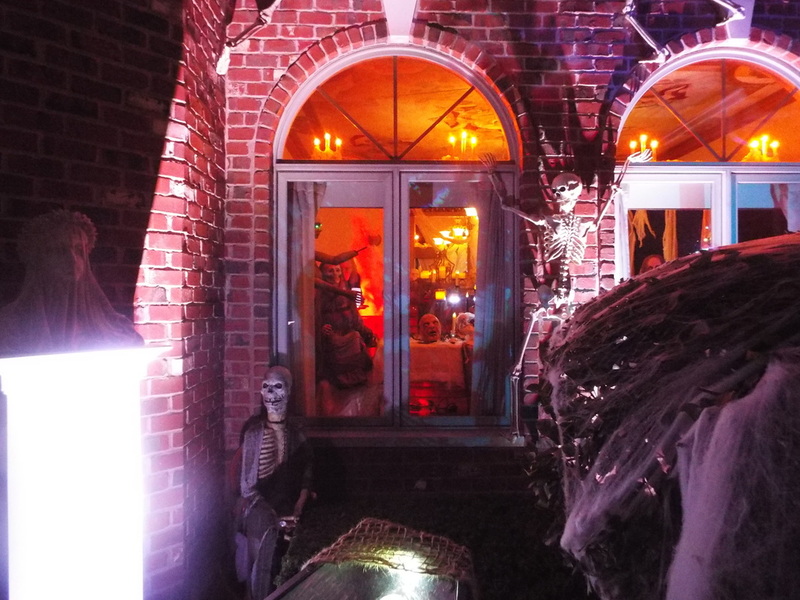 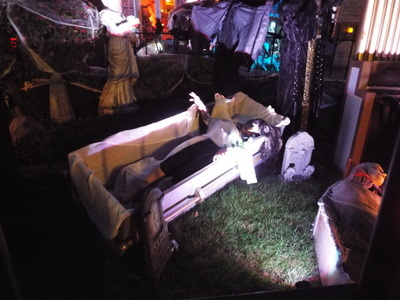 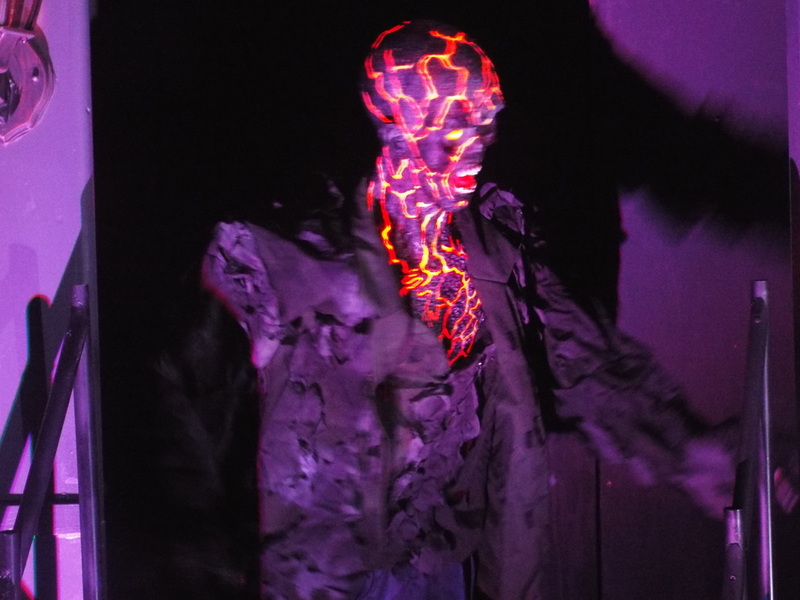 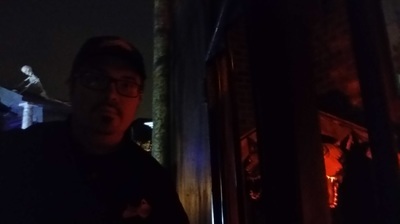 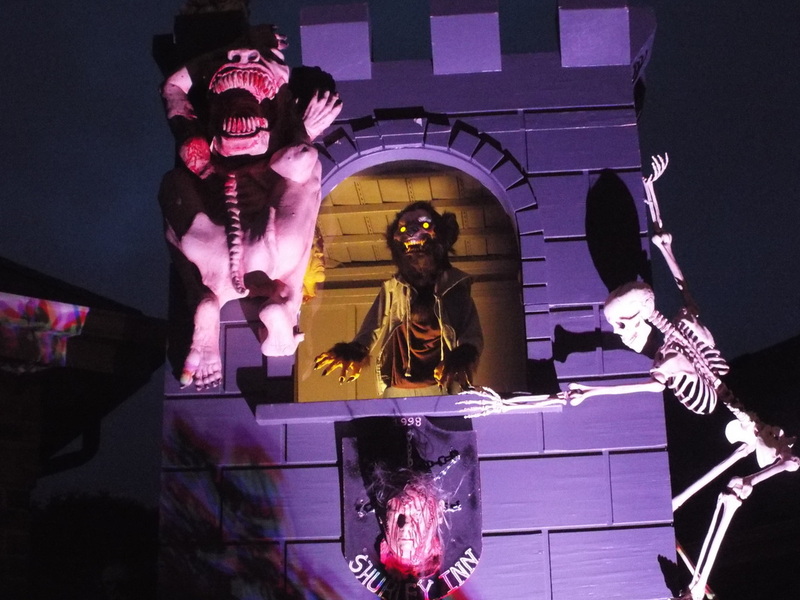 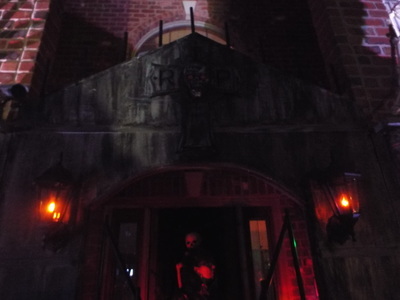 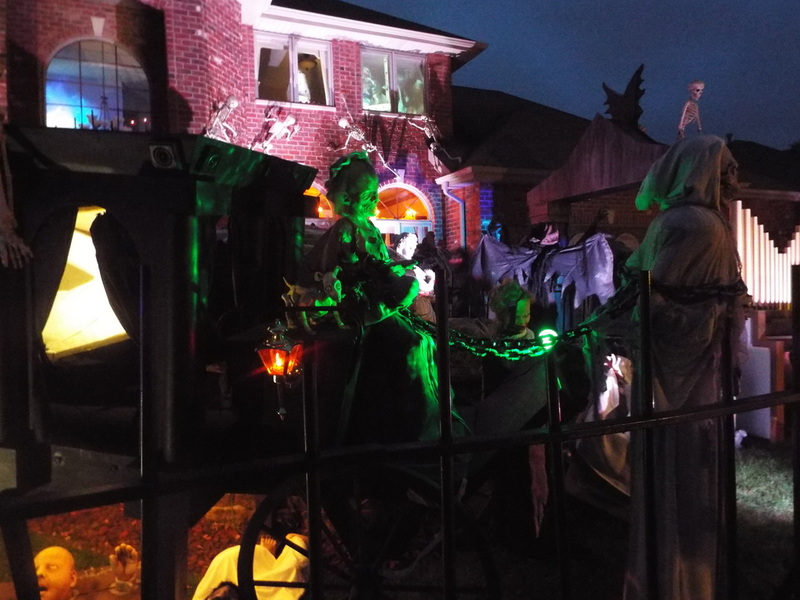 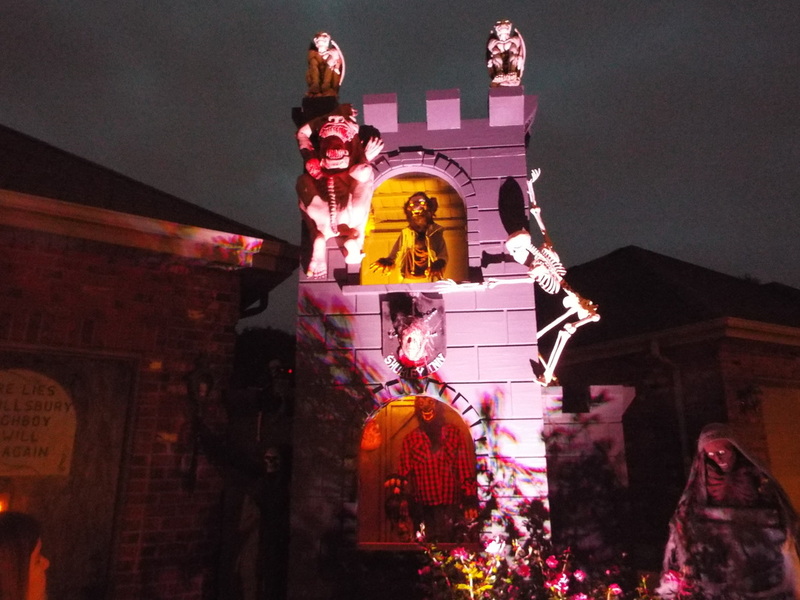 One of the great things about Halloween season is the large selection of outstanding yard displays, one of the best of which is Shurley House of the Dead in Orland Park. 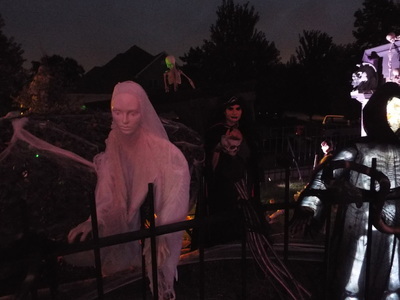 Shurley House features a large variety of animatronic props on the front lawn, in the windows, along the driveway, and even on the porch of the house. 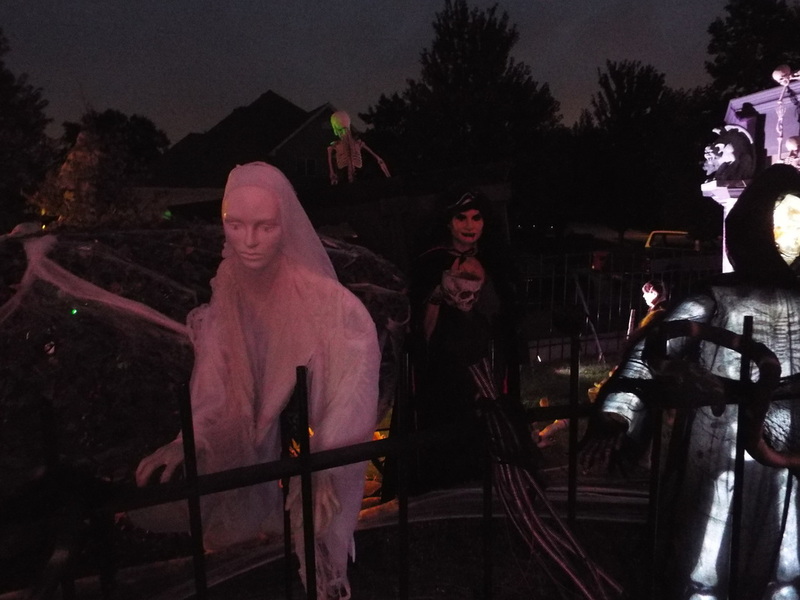 There are so many to see that one really needs to take some time to take a look at all of them, and there are always new ones each year. One of the central features at Shurley House is a large circular crypt facade that usually houses some time of animatronic figure. 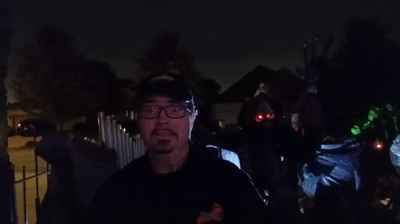 This year's featured a large man that looked as though he were made of lava. 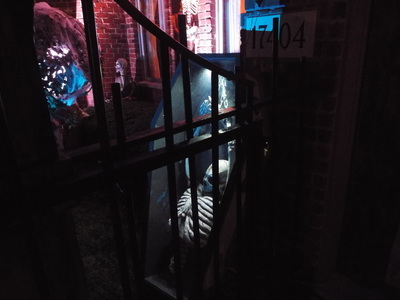 It was a really excellent prop, and one that we haven't seen before. 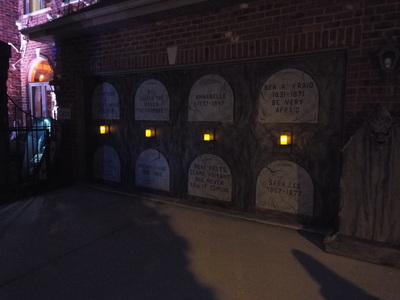 Another, smaller crypt stands just behind the first one and featured a ghostly female figure in white. 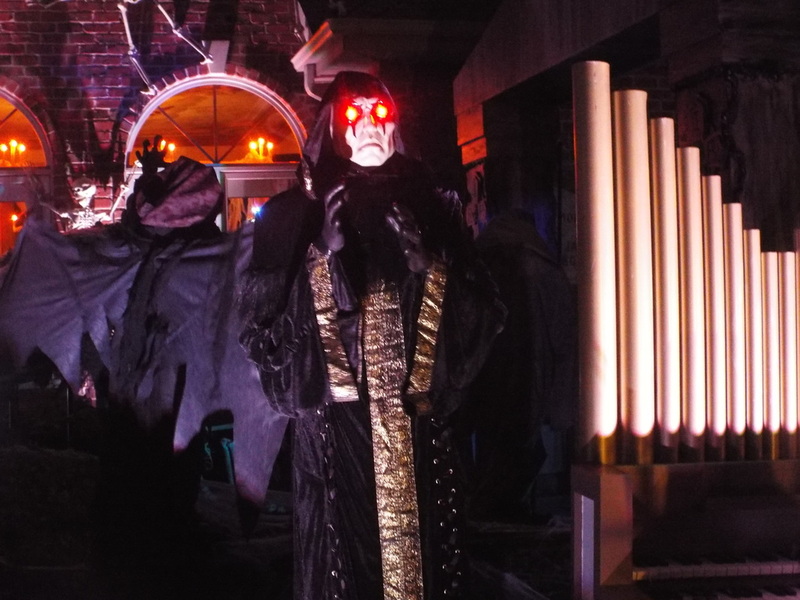 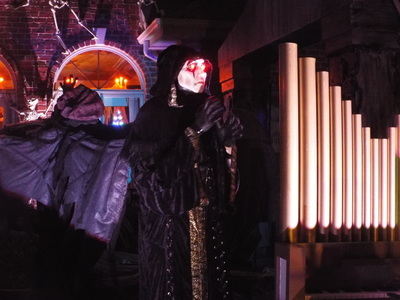 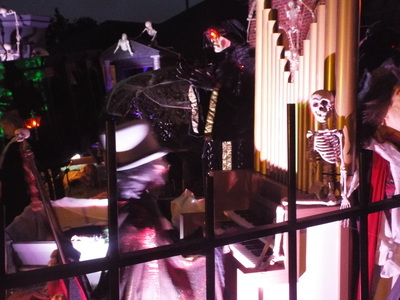 Filling out the front yard are numerous other props, including some shaky corpses in coffins, a large old-fashioned hearse driven by a and old lady (with another shaky corpse inside), skeletons, figures of death, creepy robed figures with glowing eyes,and even a Phantom of the Opera type character playing a pipe organ. 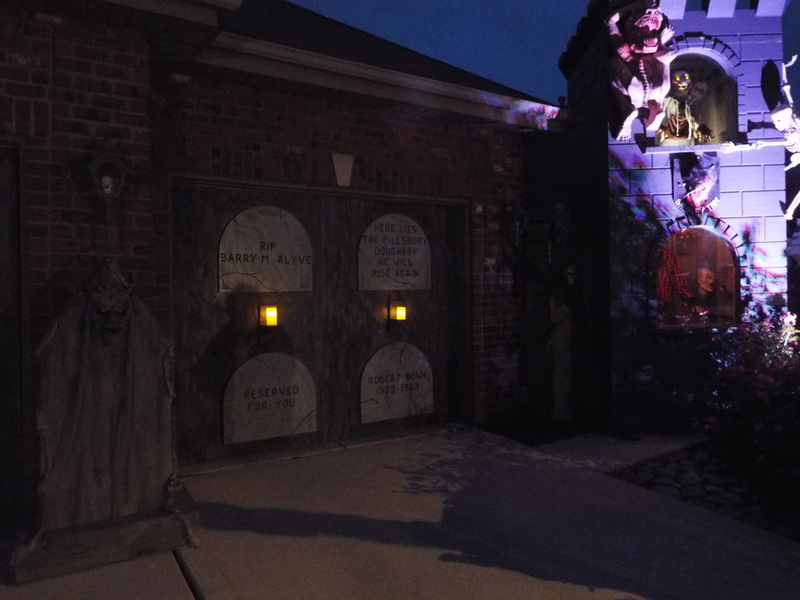 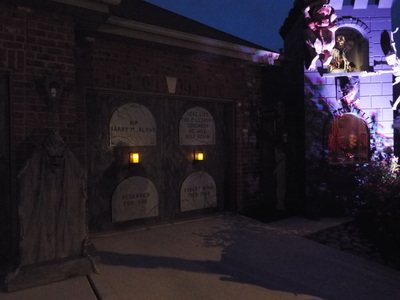 The display continues along the driveway and onto the opposite side of it, with a new feature this year - fake headstones on the garage doors that make them look like a mausoleum with its individual resting places. 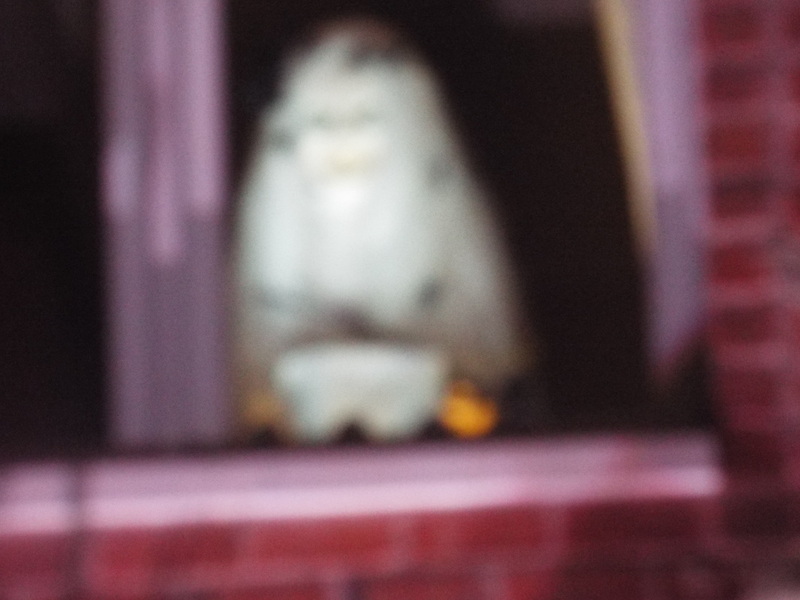 Along the right side of the driveway is a large tower which this year featured a howling wolfman figure in its top window. 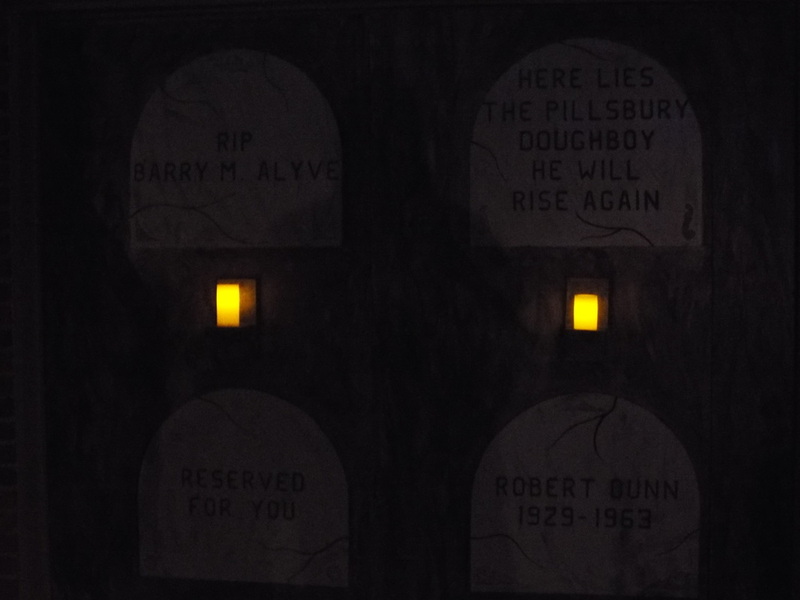 But that's not all. 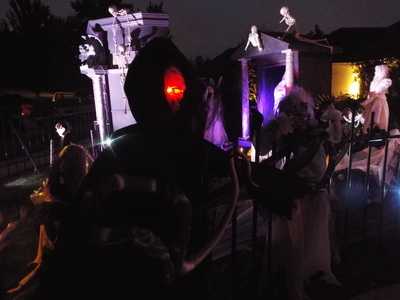 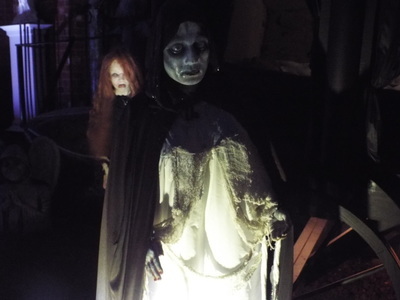 Over the walkway leading to the house is a large faux stone archway with fake iron gates, and all along the walkway are figures standing by the fence, including a glow in the dark skeletal figure in a black robe, a winged demon with red eyes, and a female statue that looks static but that actually raises its head from time to time to "look" at visitors passing by. 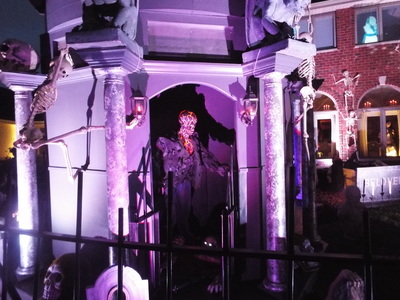 Each of the large windows oft he house feature something as well, with projections and figures occupying the upper windows, and other ghoulish scenes filling out the lower ones. 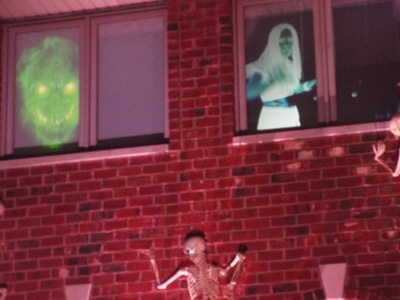 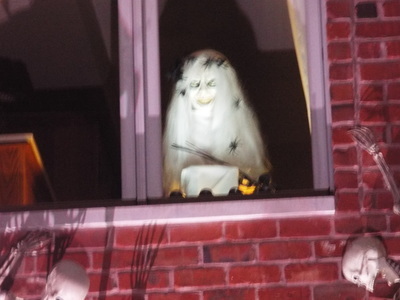 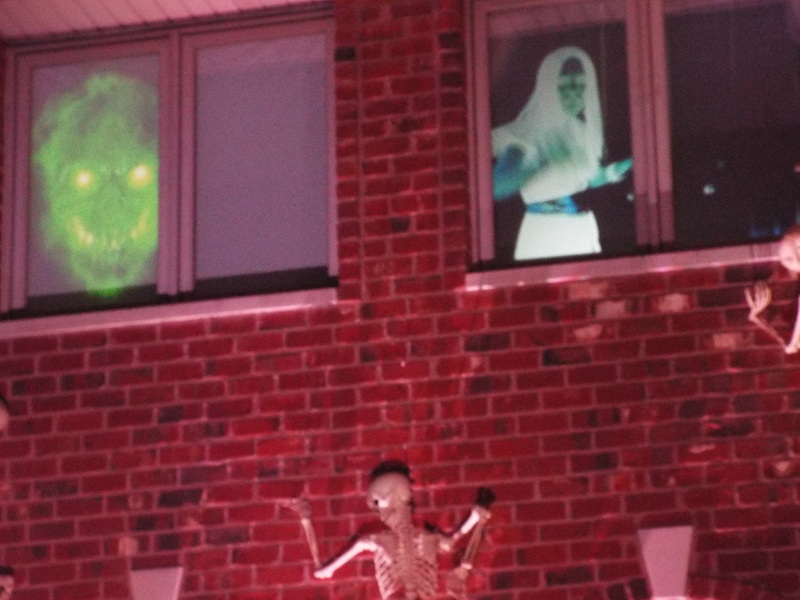 This year, the lower right house window (which always features different scenes) featured (amongst other things) a moving mannequin of the kind that might display clothing. Odd and creepy. 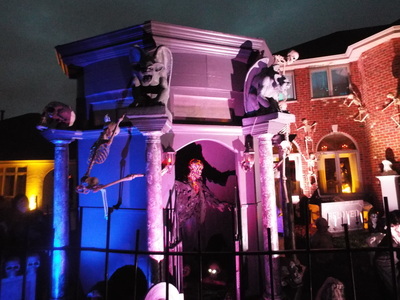 Finally, there is the front porch itself, which is surrounded by another archway, along with a pair of metal gates. 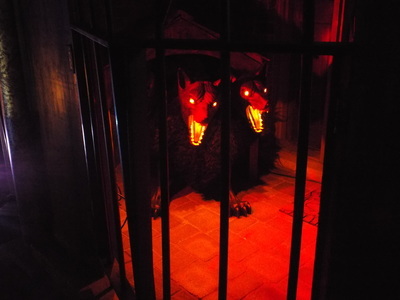 This year's incarnation featured a moving figure of Cerberus, the three-headed dog that guards the gates to Hades in Greek mythology. 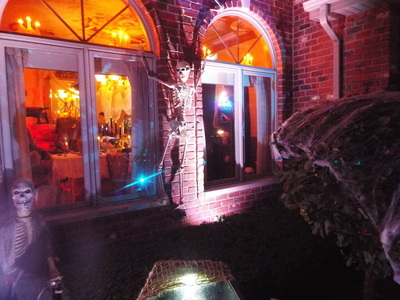 A very cool prop indeed. 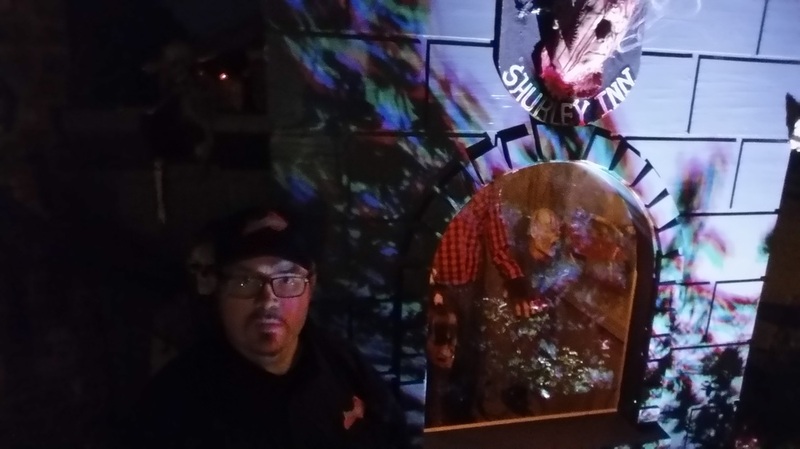 Overall, Shurley House offer a lot to look at, all accentuated by music and lighting, and even live actors on certain days. 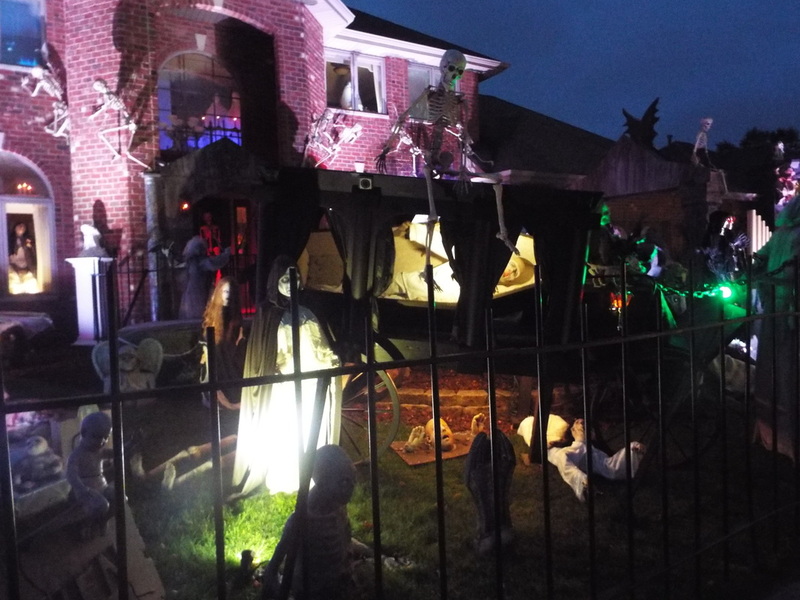 It's a great yard display, and one of many great ones in and around the Orland area, so check it out when you get the chance. 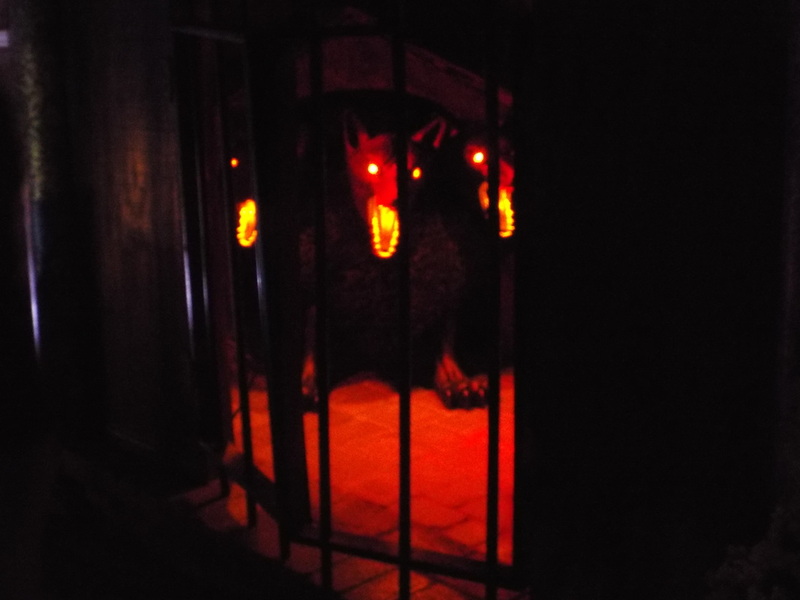 You won't be sorry!